The six inches of snow that fell overnight may have caused headaches for folks who drove to work. (I wasn’t one of them.) But hundreds of people opted to turn their commutes into a fun adventure by checking out Divvy bikes this morning. The bike-share service reported that 236 people used the big, blue cycles this morning. Lest you assume that all of these snow bikers were seasoned Divvy users, it turns out that five of the trips were taken via the system’s new $3 single-ride passes. A sixth voyage was made by someone who purchased one of the new Explorer Passes, which allow users to take an unlimited number of trips up to three hour within a 24-hour period. The top station this morning was at Washington and Clinton by the Ogilvie Center Metra terminal, a popular place to use Divvy as a “last mile” solution for getting to workplaces. It’s too bad that the city of Chicago missed the memo about all the winter biking that was going on this morning. 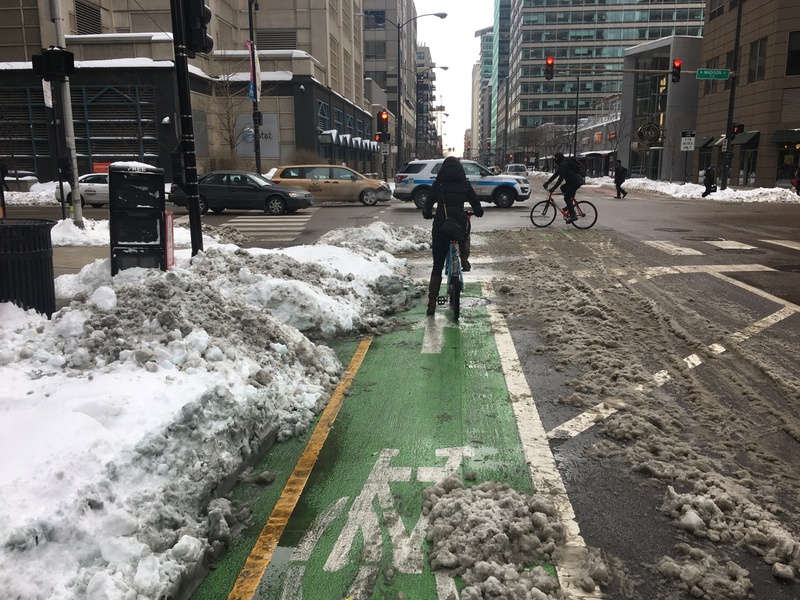 As people pointed out on Twitter, some of Chicago’s most popular protected bike lanes were clogged with several inches of slush long after the mixed-traffic lanes were cleared. 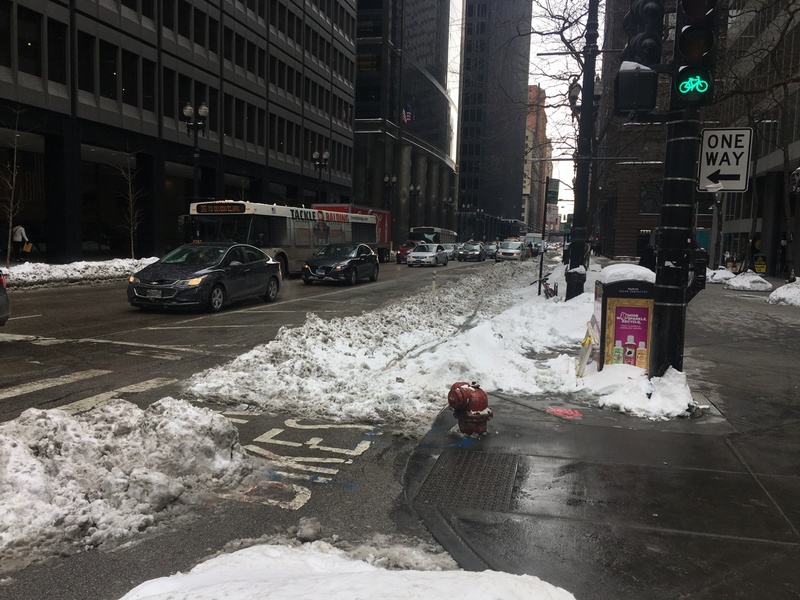 The Divvy ridership numbers prove that Chicago deserves its recent recognition as a place with “badass winter bike commuters.” But the failure of City Hall to treat cycling as a viable winter transportation mode proves that Chicago still ain’t Copenhagen. I did the contrarian commute by car. Far northwest side to Tribune Tower in 25 minutes! Metra was delayed and the so was the blue line. Often the bike lanes take a day to clear. Thursday, Milwaukee was already bad but Kinzie was a mess (as usual) by Blommers to the Mart. Protected lanes get no respect! I drove locally a little, arterials were fine and very low traffic. I think most people just stayed in. Sorry, but they are not “bikers” they are bicyclers and they are not “badass” they are dumbass. Nor do the so called “protected” lanes deserve any respect since the represent a tiny fraction of commuters even in perfect weather. During peak periods about 40 percent of all vehicles on Milwaukee Avenue, shown above, are bicycles. During good weather maybe, but during winter?? Yep, Chicago bike use drops off during the colder months. 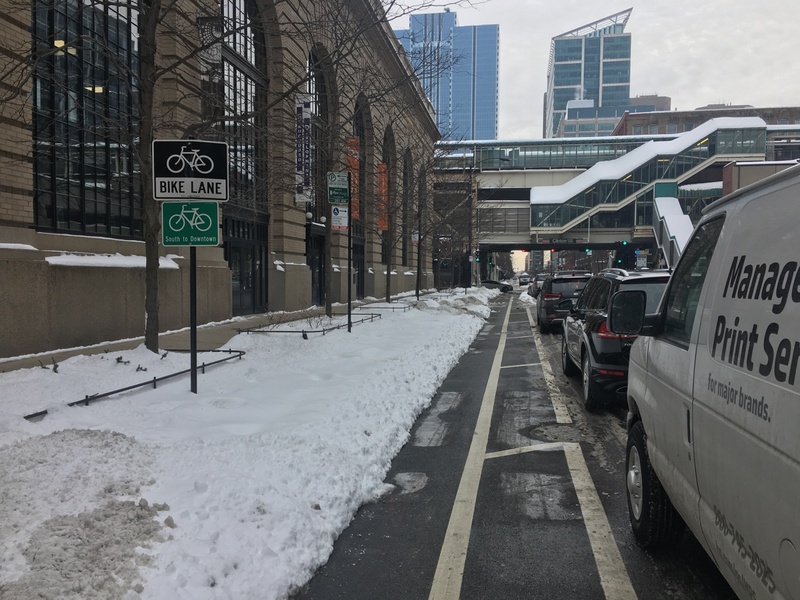 But even in the dead of winter there’s are noticeable bike rush hours on Milwaukee on the Near Northwest Side — provided that the bike lanes are clear of snow. Arthur John Greenfield did not like my detailed rebuttal to his little blog post, so he had my comments removed and then lobbied to ban me from DISQUS. Sounds more like someone working for an authoritarian dictator, and pushing the party line, than a free, democratic exchange of information. Dear posters, If you honor truth, honor journalism, honor a free exchange of ideas, then let John Greenfield know that his censorship of opposing views is wrong, wrong, wrong. Perhaps, John Greenfield, you should get a job at RT where your methods would be better appreciated. Torture the numbers long and they will confess to anything. You can cherry pick select city blocks at certain times a year to justify your point, but in reality, only 4% of all Chicago commuters travel by bicycle. the other 96% of commuters travel by public transportation, rideshare services, taxi, personal automobile and walking. Yet we have disrupted the daily commuting of the 96% by trashing more than 200 miles of streets, with another 100 miles on the way, all for a tiny fraction of city commuters. Bicycle riders will NEVER break single digit percentage in ANY city in America… NEVER. Really Michael? You sound as if you have some hostility issues to resolve. Bicycling is a viable form of transportation here in Chicago. For every bike on the road, there is one less car in your way, enabling you to get where you’re going faster. @David – Yes, Really. Seeing as how there are a million fewer people in this city since I first started driving, and fewer cars, the only reason Chicago has elevated to the most traffic congested city in America (and that includes public transit and rideshare and taxi being slowed to a crawl) is the advent of of hundreds of miles of bicycle lanes and “road diets” and intentionally slowing bus and car traffic and elimited traffic lanes and instead replaced with bicycle lanes to serve a very tiny minority on self entitled bicycle riders who care nothing about other forms of transportation than the mode they personally take… damned be the other 96% who are commuting by means other than bicycle – damned be the business and commerce and family time consumed by the selfish, radical, car and bus hating bicycle evangelists that can’t see past their own self centeredness. Maybe because people like you vehemently oppose any sort of investment in bike infrastructure. Bike lanes take up less space, cost less, and promote environmentally friendly, and personally heathy practices. Maybe if American cities weren’t exclusively designed around the automobile, people would bike more. With this well thought-out, detailed and respectful explanation it is glaringly obvious that a massive injustice has been perpetrated on you. I lived on Milwaukee in the 90s and visit often. Just arrived back from time there over Christmas. In the 90s it was a dead zone. Now it is booming. Sorry about your commute in your car. It must make you so mad you feel the need to charge anyone advocating for better urban transportation design with dishonesty. Sorry. I agree, you will never see double digit bike usage. But then you and your generation will pass on so us pesky kids can finally get some things done in this city! Maybe some of the things you hate so much might make you happier. I got a good chuckle out of that diatribe. Thanks Mike. You made my day! They are still a crapshoot today. On Clinton, which is a two-way bike lane, there’s only enough space for one-way. This is another reason why two-way bike lanes on one street instead of two one-way bike lanes on two streets is a bad idea. Randolph from Michigan to Clark had a slew of obstacles as of 1PM. Does Divvy Need to Be Made Idiot-Proof? Improving the bike route directions and making the app accessible to people with colorblindness would be a plus.